Georgia divorce litigants have the right to have their divorce tried by a jury when the request for jury trial is made in writing and filed with the court before the case is called for trial. Generally a demand for jury trial is timely when included in the divorce petition or in the defendant spouse's answer, or in a counter-petition by the defendant. 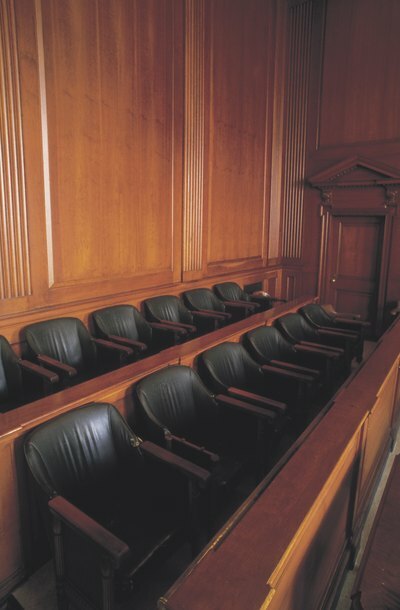 Jury trials are only provided in cases where responsive pleadings are filed, meaning the case must be contested, as there is no need for a jury to decide a case where there is no controversy between the parties. Draft your divorce pleading and include a demand for jury trial. Pleadings begin a case and include the petition, the answer, and sometimes a counter-petition in which the defendant can challenge the terms requested by the spouse who initiated the divorce. A demand for jury trial may be included in any of these initial documents. The demand may also be included in any filing submitted to the court before the case is called for trial, which means prior to the end of all preliminary hearings. Review your pleading before submission to make sure your demand for jury trial is stated clearly so the court understands exactly what you are asking for. Include a jury trial demand in the style, or title, of your pleading. For example, "Complaint for Divorce and Demand for Jury Trial," or "Answer to Complaint for Divorce and Demand for Jury Trial." The last paragraph of the pleading should include the actual demand in language such as, "Plaintiff (or Defendant) respectfully demands a trial by jury on all issues that are by right triable by jury." File your pleading, including the demand for jury trial, with the court. Serve the pleading on your spouse just as you would if the pleading did not contain a jury trial demand. Your jury trial demand will be granted if it is made before the case is called for trial, because a judge's denial of a timely demand for jury trial is reversible error, meaning the trial outcome can be reversed on appeal. Make a jury demand in writing after the case is called for trial if you feel such a demand has become necessary. The judge does not have to grant the demand after the case has been called for trial, but he has the discretion to allow it even though it is untimely. Daniel and Taylor, PC: You Have The Right To A Trial By Jury! Pennsylvania offers spouses more ways to get divorced than most states. In addition to several fault grounds, the state offers two separate no-fault options. The first and easiest no-fault option involves spouses jointly signing and filing a mutual complaint for divorce, so contesting the process is not an issue. Pennsylvania's other no-fault option is irretrievable breakdown of the marriage, and a spouse can contest these grounds. Can You Contest a Divorce in Florida Without a Lawyer? Sometimes a divorcing couple can only agree on one thing: that they want a divorce. In Florida, if you and your spouse fail to reach common ground on the terms of your divorce, the matter is referred to as "contested." Contested divorces can include a trial and involve more legal formalities than uncontested divorces. For that reason, hiring an attorney, while not required, can be helpful to make sure that you comply with the many procedural rules. In Minnesota, a divorce defaults when one spouse refuses or neglects to become legally involved in the process. If he is served with a divorce petition and does nothing, the divorce will eventually default. This generally means that the court will give the spouse who filed for divorce everything she requested. Ignoring divorce papers does not mean the divorce will go away. It usually means the divorce will happen more easily, because one spouse is not involved to contest any of its terms.